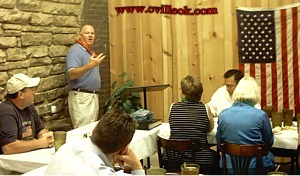 Collinsville High School's new head football coach, Bob Craig, addressed the Chamber of Commerce Thursday. Bob is a graduate of Tahlequah H.S. and had his first coaching job at Cleveland. Mr. Craig coached at Coweta for 20 years. Coach Craig has had his teams in the playoffs 19 of the last 27 years. In describing his coaching approach, he said that although this season is very important, his longer range goal is teaching the athletes lessons that will serve them for the rest of their lives. One of the lessons stressed is the difference between just being involved and being committed. He feels that kids that see the results from committment will be better students, athletes and citizens. Coach Craig uses a 1/3's approach with his players, having them view the season in 3 separate parts (preseason, district play and then playoffs). He also wants them to understand they are just a part of the larger cast of those involved with cheerleaders, band, fans and school administration also being equally important.